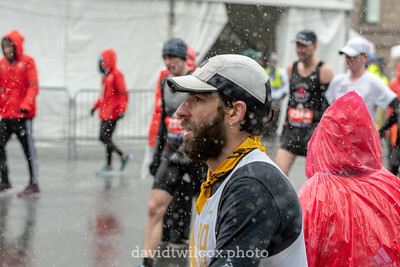 The 122nd running of the Boston Marathon was one of the wettest, coldest, and windiest races in the history of the world's oldest marathon. 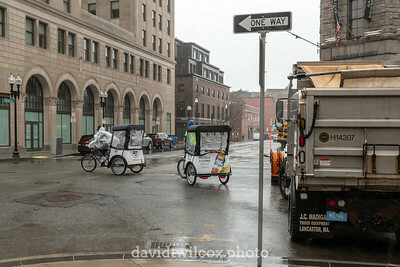 With dump trucks blocking the main streets in the Boston Marathon vicinity, pedicabs were the only option besides walking that were allowed in the area. They weren't shy about letting you know that, either. 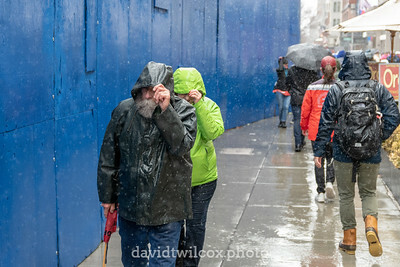 The wind and rain were relentless. When it wasn't pouring, it was stinging mist; a gentle breeze could turn into a sudden gust powerful enough to make a person stumble or fall. Most of the time, both wind and rain were steady and persistent. 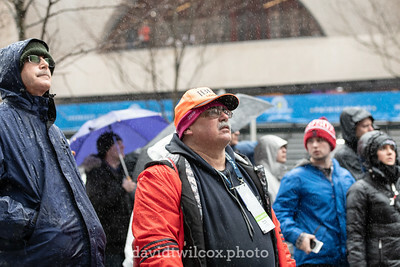 A Jumbotron was set up near the finish line and the crowds were gathered there to watch the progress of the race. 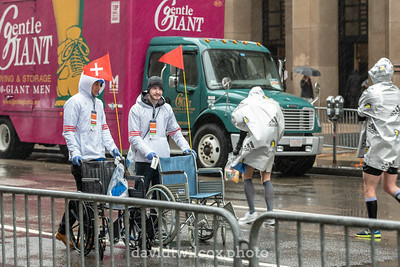 At this point, American Tatyana McFadden had won the wheelchair division moments earlier and the eventual women's race winner Desi Linden had just taken the lead. 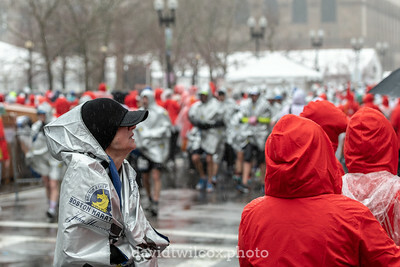 Spectators, volunteers, medical staff, race officials, and media crowd together at the finish line on Boylston street. 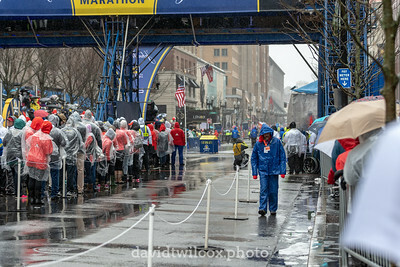 No matter the weather conditions, running across the blue and gold finish line is one of the greatest experiences any runner can have. 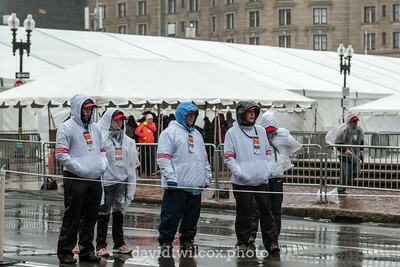 Medical staff watch for ailing runners near the finish line. 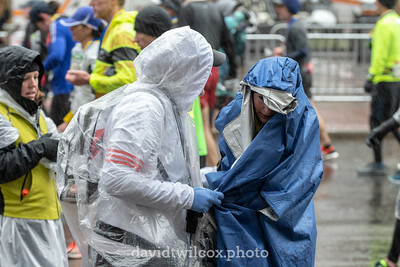 In the cold, wet conditions this year, hypothermia was a big concern and the medical staff were working extra to take care of runners in need. Crew and cameras were waterproofed as best they could. 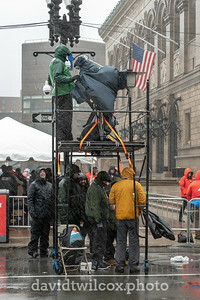 Even the pro photographers with weather resistant camera bodies and all-weather lenses had their gear wrapped against the wind-driven rain. CBS Sports was no exception. Like a colony of nesting seabirds, a tightly packed group of volunteers stand ready with finisher's medals to hand out to runners as they pass. 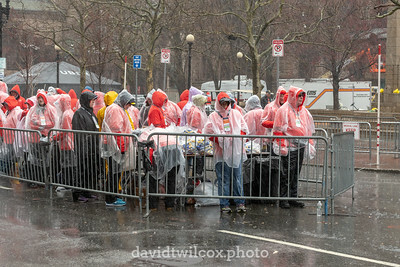 While spectator numbers were down somewhat compared to other years, tens of thousands of people still turned out all along the marathon course and at the finish line. 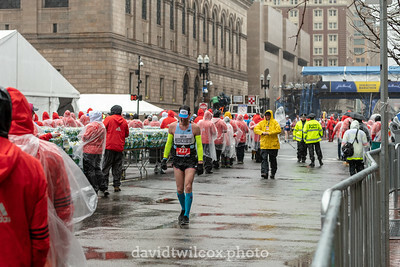 Many stood in ankle-deep puddles for hours waiting for their runner to come through, or even to simply cheer for strangers. 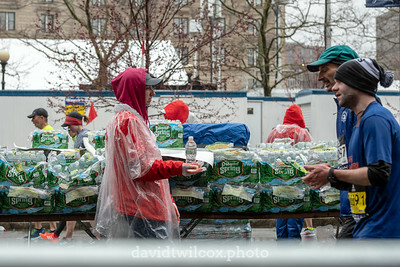 An early finisher takes the walk down the line of volunteers handing out water bottles, heat wraps, and snack bags. 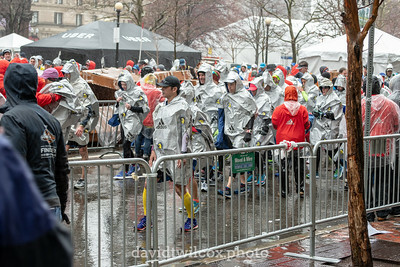 Later on, dozens of finishers would come through both sides of the chute simultaneously and crowd the area. 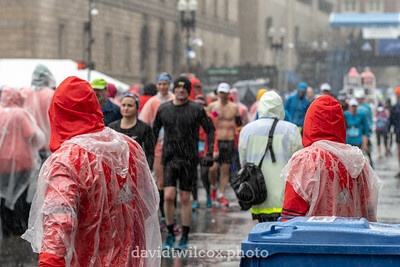 A few runners were either carrying their own mylar emergency blanks or had one handed to them by spectators before they even received the official heat wrap. 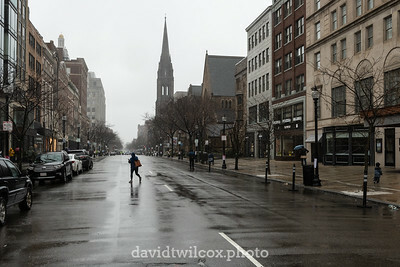 Under the conditions, the notoriously long walk from Copley Square to the gear pickup area felt even longer for many. Wet runners. Wet volunteers. Wet roads. Wet tents. Everything was wet. 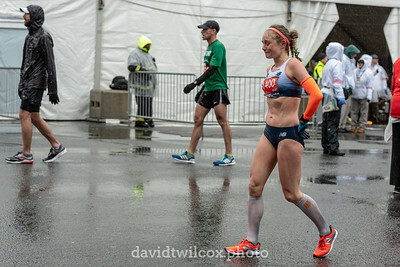 If nothing else, the two themes of the 2018 Boston Marathon were surprise winners and wet. 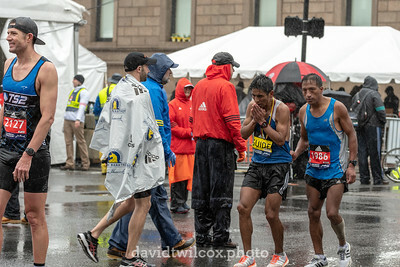 Luis Calo of Ecuador and his guide runner finished the Boston Marathon in an official time of 2:48:01 and won the men's visually impaired division. Veronica Jackson of Weehawken, New Jersey, finished in 2:49:41 and placed 13th in the women's division. 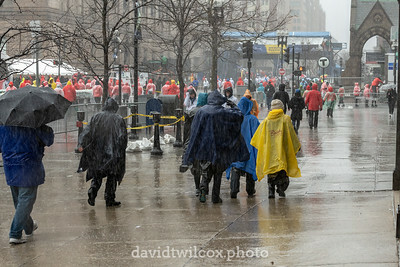 The walk from the finish line at Copley Square to the gear pickup and family meeting area is infamous for being long. Medical staff were stationed along the length of the trip and many were staying busy. The medical tents at both ends of the walk were full, with staff running it and out continuously. Some people like having their photo taken. This man was one of them. 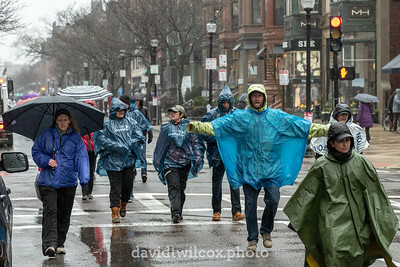 Once you've stood in the rain for hours on end, you can choose to be miserable or enthusiastic. He chose the latter. 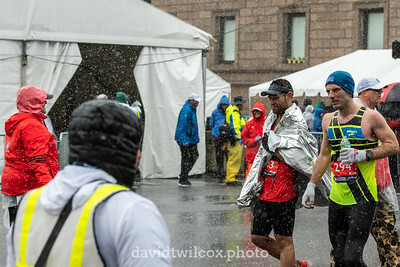 A runner stops to talk to volunteers while fighting back the chill that quickly set in as runners' bodies cooled from their exertion. A parade of silver-wrapped runners march awkwardly and painfully through the long chute, heading next to get a bag of post-race snacks. Many runners had the same painful, tight quadricep shuffle that set in almost immediately after they stopped running. 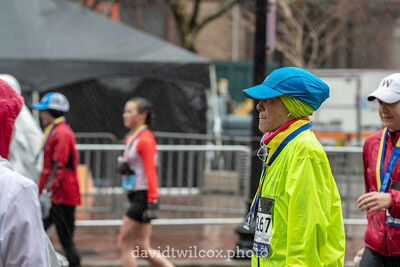 Some runners checked their phones as soon as they finished, others marched with a dead-eyed stare past the volunteers, but a few stopped for a moment to take in the moment. 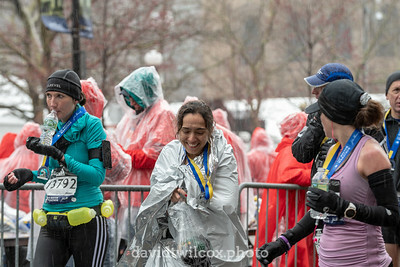 Watching many runners that were obviously strangers up to that point hug, high five, or otherwise share the joy of the moment showed how close together an experience like this can bring people. 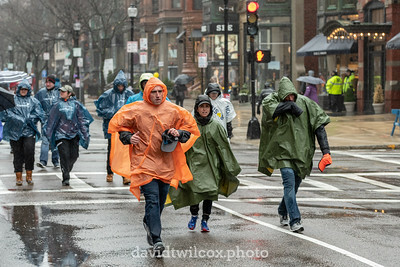 People that paid to run in this weather file past people that volunteered to stand in it. Even the most enthusiastic volunteers were getting ground down after a while. 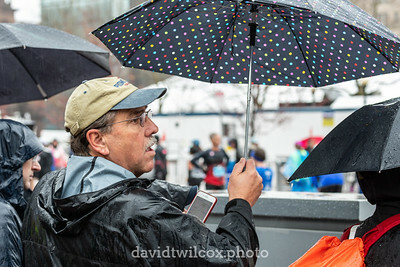 While this volunteer did put on a smile and congratulate runners, there were a few brief spots where the exhaustion from a long, wet day were showing through. 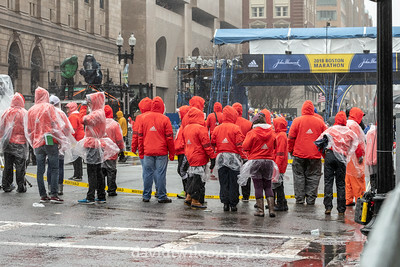 A common scene near the finish line were spectators frantically glancing between the official BAA app sending them updates on their runner's status and the crowds of runners coming through the finish line. No one wanted to miss their runner come through, but it was difficult at best to spot individual runners in the later crowds.